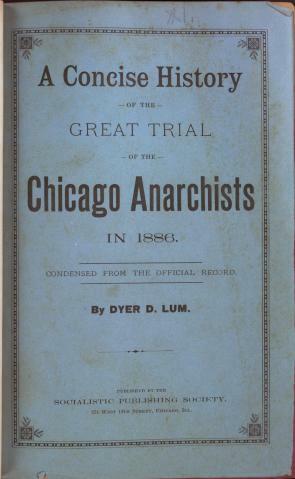 The Haymarket Affair is considered a watershed moment for American labor history, at a time when fears about the loyalties and activities of immigrants, anarchists, and laborers became linked in the minds of many Americans. On May 3, 1886, unarmed strikers clashed with police at Chicago’s McCormick Reaper Works factory. The deaths of six workers became a call for direct action, and a public rally was called for the following day to be held in Haymarket Square. Again, the police and the strikers clashed, but this time a bomb was thrown, resulting in the death of seven policemen and many in the crowd were injured. The police, uncertain about the source of the bomb, fired into the crowd, killing four of the demonstrators. The identity of the bomb thrower is still a mystery, but eight men were indicted on charges of conspiracy to commit the act. All eight were convicted of the conspiracy charge even though it was understood none had made or thrown the bomb. August Spies, a German anarchist, laborer, and activist, and Albert Parsons, a socialist laborer, activist, and former Confederate soldier from Texas, had been among the fiery and well-known speakers at the rally. Spies and Parsons, along with Adolph Fischer and George Engel, were executed by hanging. Louis Lingg, the fifth condemned to die, committed suicide while awaiting his sentence by biting down on a blasting cap in his cell. Three other defendants—Samuel Fielden, Oscar Neebe, and Michael Schwab—were sentenced to prison terms, but were pardoned in 1893. The eight social heretics of Chicago who dared to defend their beliefs when tried for an act, of which it was openly admitted they were not personally guilty, have challenged the attention of the world and the admiration of the oppressed of all lands. The book’s preface can be read here.